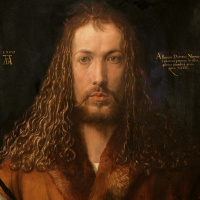 Albrecht Durer (May 21, 1471, Nuremberg, Holy Roman Empire, to April 6, 1528, Nuremberg, Holy Roman Empire) was the most important German painter and engraver of his lifetime, achieving worldwide fame; an outstanding geometer and fortification engineer; the founder of European watercolors; and a mechanic, architect and art theorist. 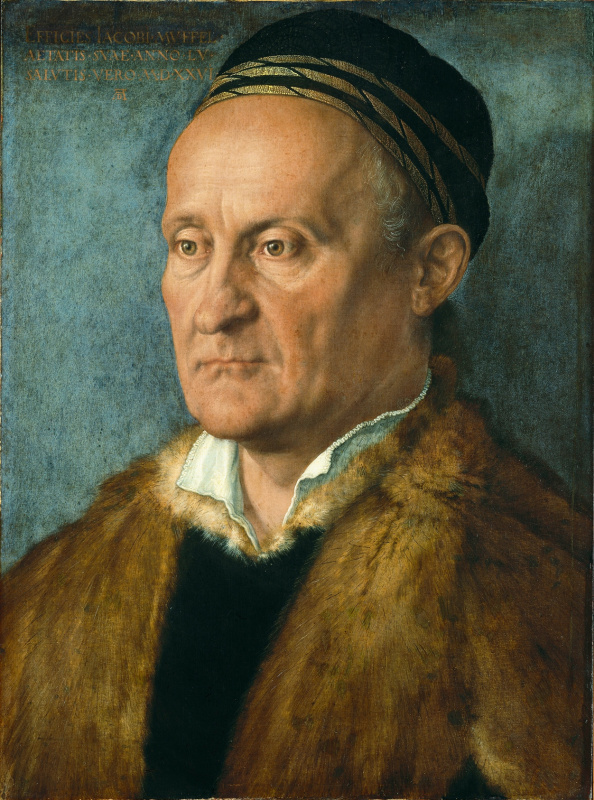 He combined the discoveries of the Italian Renaissance with the artistic traditions of Northern Europe. Attributes of His Works: Durer’s engravings retain the precision and subtlety of detail inherent in German culture, but they stick out due to the ingenuity of composite solutions that were hitherto unprecedented. Artists were especially interested in the problems of harmony and beauty of the human body, the laws of proportions, and the detailed drawing of human hands. 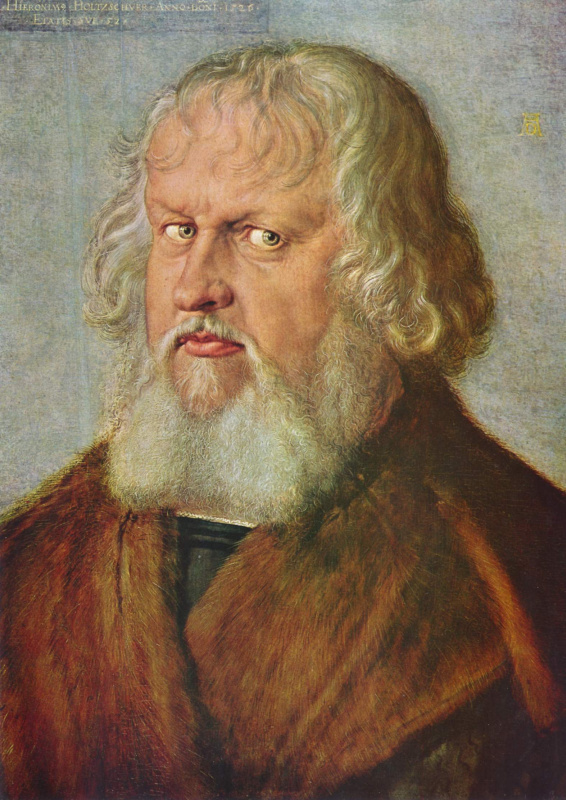 Durer’s paintings are distinguished by bright, sonorous, enamel colors. His watercolors are characterized by an amazing accuracy in the reproduction of natural phenomena. Famous Works: Melencolia I, Great Piece of Turf, Adam and Eve, Young Hare, Four Horsemen of the Apocalypse, Feast of the Rosary, Rhinoceros, Knight, Death and the Devil. Durer’s father, a Hungarian gold and silver-worker also named Albrecht Durer, arrived in Nuremberg on June 25, 1455. On that day, the local patrician Philippe Pirkheimer was getting married at a castle under large linden trees. For the elder Durer, this seemed like a good omen, and he remained in the city for good. He was hired to work for the burgher Jerome Holper, who soon, assessing his honesty and diligence, gave him his daughter for marriage, "a beautiful, agile girl named Barbara, fifteen-years-old." Thanks to this marriage, he received the status of citizen of Nuremberg. 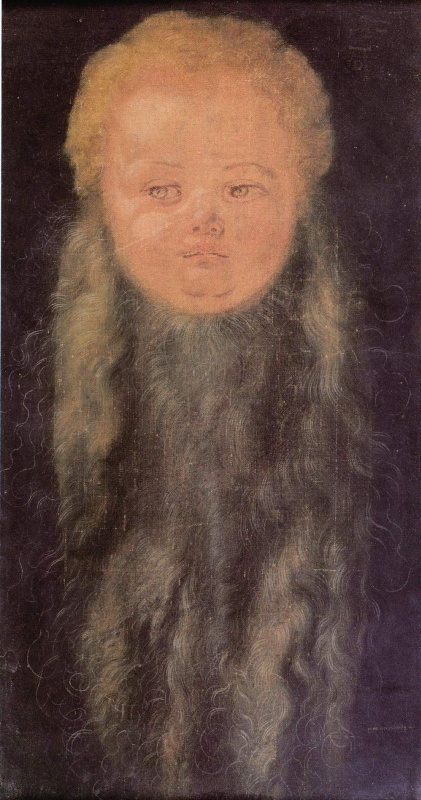 A huge number of children were born into the Durer family—eighteen—of which only three sons, including the artist, who was the third child, would survive until adulthood. His father noticed early on how Albrecht Jr.'s had a steady and accurate eye: he could confidently draw a line or circle without using a ruler or compass. Of course, his father hoped that his son would also become a jeweler and continue the dynasty, but Albrecht had other ideas. At the age of 10, he discovered the incredible joy of putting pencil to paper: "I painted in secret from my father. I knew that he would be unhappy. But drawing became necessary to me, like air." 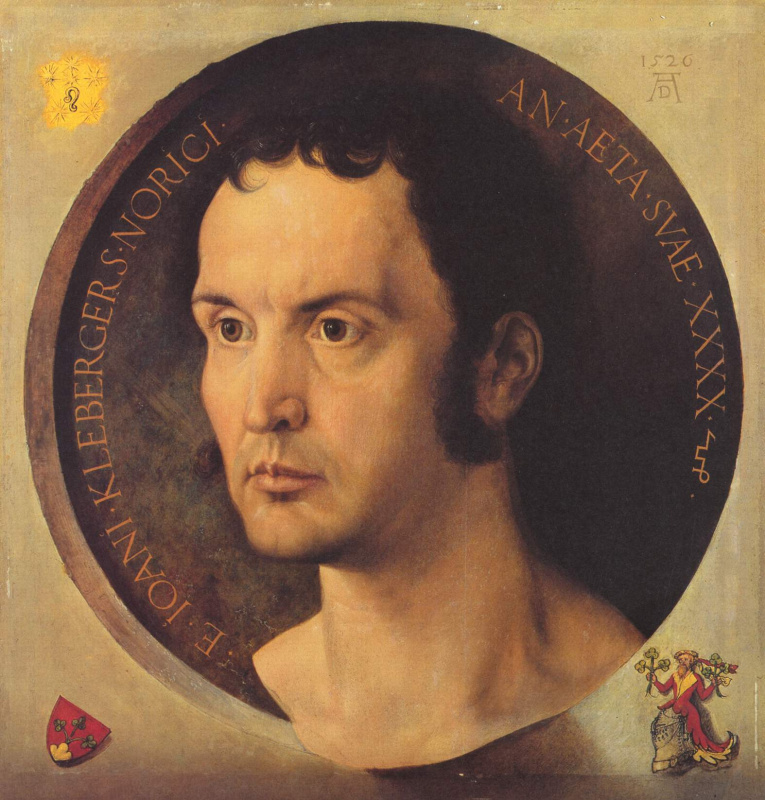 The senior Albrecht gave in and sent Albrecht Jr. to the workshop of Michael Wolgemuth, a famous painter and sculptor in Nuremberg. 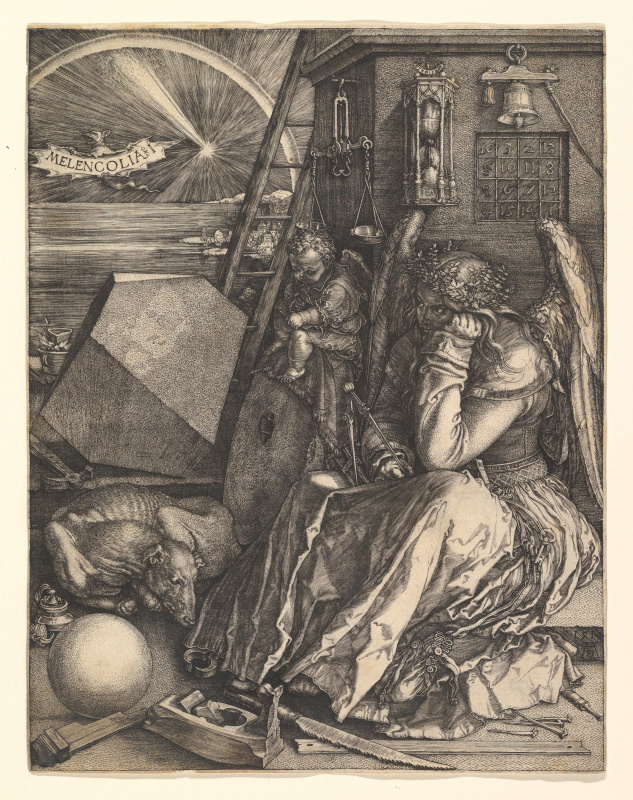 The most important thing that Durer learned from him in three years was wood engraving. Interest in lines, shapes, and proportions was, for him, more important than interest in colors and color, and the art of engraving perfectly matched his natural inclinations. Thanks to the revolution he started with printmaking, his works were seen farther abroad than those of any prior artists, and his technique, using a "cold chisel" to scratch a hard, flat surface, resulting in a printing plate with niches that would transfer ink to paper, inspired other, later artists, like Michelangelo, to print and distribute their works. Melencolia I (1514, Staatsgalerie Stuttgart) brings to mind the feeling of creative frustration, with the angel, head in hand, surrounded by artistic tools and too melancholic to actually finish a project, leading historians to suspect that the winged angel was a representation of da Vinci, who was known to suffer from a mysterious affliction that led to him being unable to complete certain works. It is a perfect portrayal of frustrated and stunted creativity; even the angel’s poor, neglected dog seems to have given up on getting any food and resigned itself to taking a nap to escape hunger pains. The angel seems to be glaring at a small cherub, sitting under a scale and writing something in a book. Just above the angel’s head, hanging from the wall, is an hourglass, slowly counting away the wasted seconds. Off in the distance a bat flies, engraved with the title Melencolia I, likely referencing Melencholia Imaginativa, the first of writer Cornelius Agrippa’s three types of melancholy. Great Piece of Turf (1503, Albertina, Vienna) is unusual for the Renaissance in that this meticulously painted and complex watercolor is simply a piece of ground that most people would have stepped on without paying much attention to. It was a detailed study of the natural world that looks more like a botanical illustration from hundreds of years later than a sixteenth century work of art, making it likely that the artist actually got down into the grass and drew it as exactly as he saw it, carefully recreating the various shades of green and brown and the patterns of the leaves and roots. Adam and Eve (1504, British Museum, Not on View) is a copper engraving that is particularly interesting for its combination of Italian and German Renaissance styles, and the way he put traditional classical illustrations the human form in a dark, Germanic forest. Eve is being offered the forbidden fruit from a scale-crowned snake, and the other animals lounge or stroll about, each one representing personality types with their corresponding body fluids. The parrot, for its cry, which was thought to sound like Eve-Ava, connecting Eve, the original sinner, to the Mary, who brought the son of God into the world to atone for sins, represents Christianity. It sits on a branch above a sign bearing the artist’s name in Latin. Three years later he painted Adam and Eve (1507, Museo del Prado, Madrid) after a trip to Venice, a life-size double-panel oil painting depicting the same subject but with a black background and soft light; all the focus is on the Biblical figures with nothing to distract from their perfection. Young Hare (1502, Albertina, Vienna) is amazing for the amount of detail Durer was able to give to a portrait of an animal which was unlikely to sit still for long enough to paint so intricately and in an era predating the rise of taxidermy. With no background but a light shadow, its fur, whiskers and eyes were painstakingly recreated to realistically reflect the light source and texture and patterns of its hair. Many contemporary artists copied the painting, realizing its genius. At the turn of the 16th century, the end of the world was on a lot of people’s minds. Four Horsemen of the Apocalypse (1498, Not on Display), an almost unbelievably detailed for a woodcut of its time, captured the mood perfectly. The technology used to create it was revolutionary. The Biblical personifications of conquest, war, pestilence and death are ruthlessly trampling the hapless mortals, kings and commoners alike, showing the randomness of violence and misfortune and the futility of humans' desires for peace. 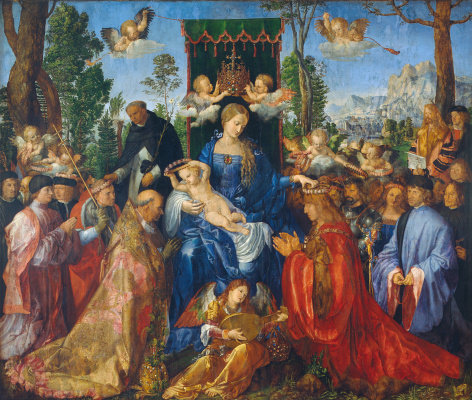 Feast of the Rosary (1506, National Gallery, Prague) was commissioned for the San Bartolomeo Church, which was a place of worship for the German community in Venice. 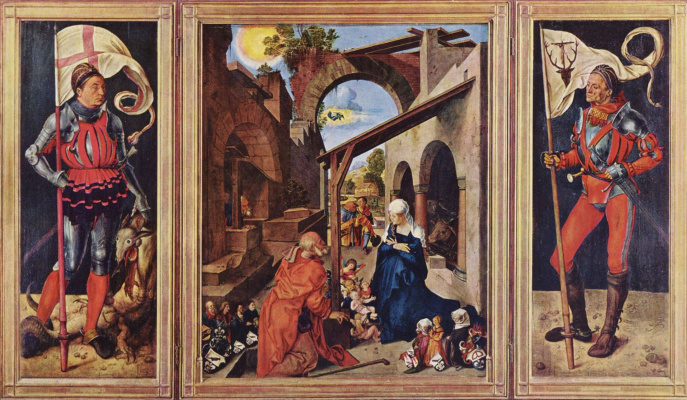 To the left of Mary holding Jesus as a baby is Pope Julius II followed by a procession of church officials, and to the right is Frederick III, Holy Roman Emperor, the German ruler, and a lay procession, thus both the church and the state are represented. Jesus is crowning the pope with a garland of roses, and Mary is crowning the emperor with the same. At her feet is a cherub playing a lute, a reference to the altarpieces of Giovanni Bellini. 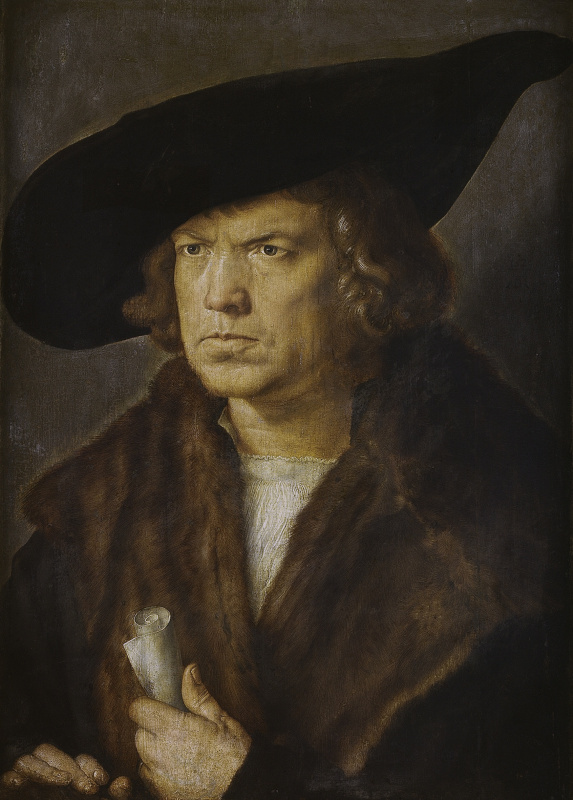 The German Alps can be seen in the background, and Durer himself can be seen to the right under a tree, dressed in gold, and holding a scroll bearing his signature and the amount of time he worked on the painting—five months. Despite having never seen the animal, Durer’s woodcut Rhinoceros (1515), based off of a witnesses' description and hurried sketch of an Indian rhinoceros that was a gift to Pope Leo X from King Manuel I of Portugal (which, unfortunately, died en route in a shipwreck), became cemented in the imagination of Europeans as an accurate representation of the beast for hundreds of years. He added a short, twisted horn at the base of the neck, what looks like a literal coat of armor, and reptilian scales on its legs. This image was one of the main prints that set off the printing revolution, with 4000−5000 being printed, and even pirated copies were sold. Durer’s name for Knight, Death and the Devil (1513) was actually The Rider. Protected by his armor (faith), the knight rides bravely past the incarnation of Death and the Devil in the valley of the shadow of death, fearing no evil, with his loyal hound. This powerful piece has inspired poets, writers, philosophers, and was even used as propaganda by the Nazis as a portrayal of the ideal Aryan soldier, although some have speculated that Death and the Devil are in fact the rider’s fellow travelers and not adversaries. Or perhaps it is both, even the purest of warriors needs to both fear and welcome Death, and sometimes deal with the Devil. 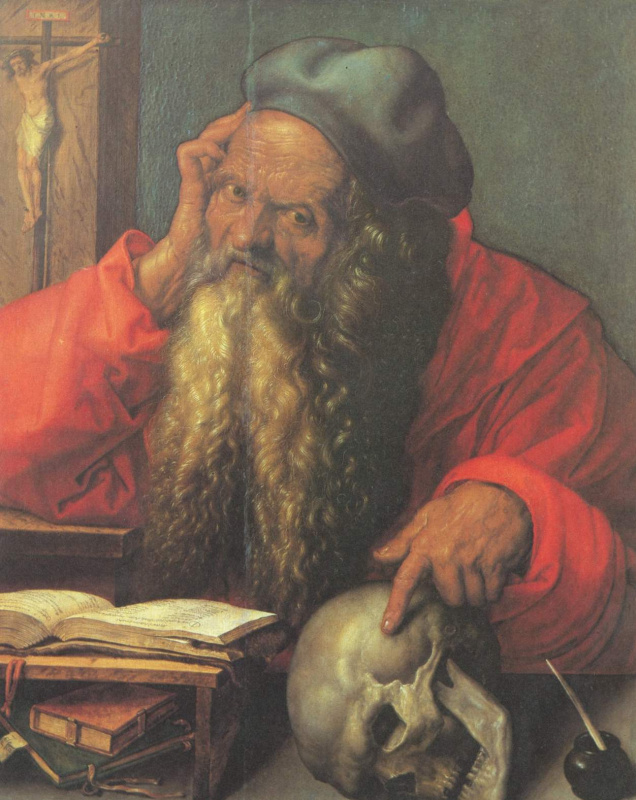 Durer died on April 6, 1528, at the age of 56 in Nuremburg and was buried at the Johannisfriedhof cemetery. He left behind several unfinished works, as he worked much more slowly in his last years, and his former house is now a museum.